This year in the Derwood Demo Garden we planted a 10×10 bed we’re calling the Grow It Eat It Garden. 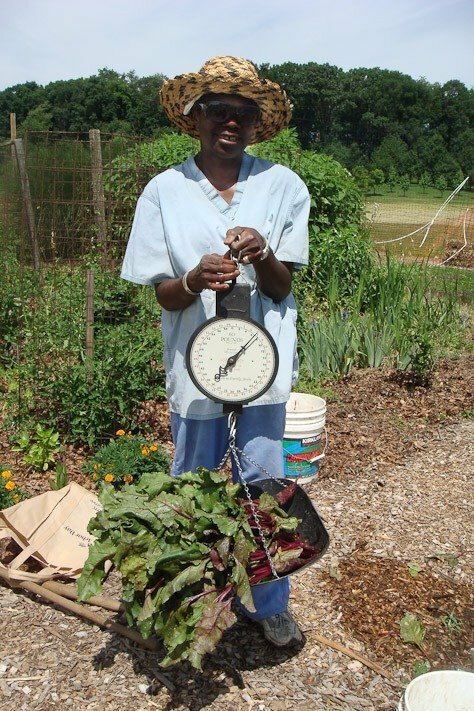 It’s meant to represent a typical home garden with the most usually grown vegetable crops, and our goal is to weigh all the produce that comes out of it and assess a value based on average grocery cost, so the hypothetical homeowner can see how much he/she is saving. We’ve had fun planting, harvesting and weighing. That’s a single tomato and a single zucchini. More to come, we hope! The tomato plants (one Brandywine OTV and one Carnival) look great, and so far so does the zucchini plant (Fordhook), though we are squashing squash bug eggs like crazy and have lost plants in other parts of the garden to borers. Our cucumber plant (Salad Bush) succumbed to wilt after an attack of cucumber beetles. I’ve planted another but it probably won’t get going in time to produce much else this season. We would normally have beans by now but had a little accident getting started and will have a delayed harvest – very soon now. Fall crops go in soon. As I’ve said before, I think the average homeowner, even a beginner, could do better than we have because of the ability to tend plants daily and replant in a more timely fashion when a crop was finished. And if I was going to do this garden over I’d probably try to stuff more plants in there. We’ve got a big garden to tend aside from this one bed, but if all you’ve got is 100 square feet, might as well make the most of it! And the total cost savings so far, calculated based on Giant supermarket prices: $153. Cost of getting the garden started not subtracted, but let’s do that at the end of the season! 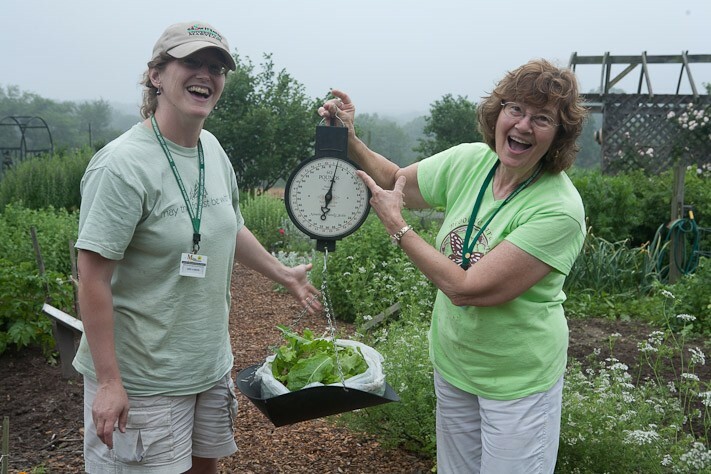 Of course, there are benefits beyond cost savings to having your own garden: knowing where your food comes from, learning about plants and insects, having fun and getting exercise. I do recommend a scale, though; gives you a sense of satisfaction. ← I DE-CLARE WAR on deer and rabbits! OKay that almost looks like you all are having TOO Much fun! Shhh! You'll spill the secret that gardening is actually NOT back-breaking, mind-numbing drudgery. Oops! I'll do the drudgery entry next time. It's always more fun when you work alongside other people, and we do enjoy ourselves! And we're here to show how to make gardening simpler and less painful, when at all possible! Great job! It's such a good garden this year and I can't wait to show it off at the tour!